Find below some of the World’s Best Social Media Marketing conferences 2019 – 2020 calendar. This year is jam-packed year of insightful top social conferences. Participating in the best social media marketing conferences can help you to gain skills other social media practitioners might not have and get you far more employable. You will also have the opportunity to meet other social media marketing enthusiasts. eDigital has made a great list of the best social media conferences with fantastic speakers covering a wide variety of topics. Hosted by Social Media Examiner, Social Media Marketing World is a mega-conference comprised of 3,500 marketing experts sharing insights into social media marketing. Discover the best social media marketing techniques from the world’s top experts and join 4,000 fellow marketers at the mega-conference designed to inspire and empower you with social media marketing ideas.Speakers will include Guy Kawasaki, Mari Smith, Scott Monty, Jay Baer, Ann Handley, Michael Stelzner, Michael Hyatt, Amy Porterfield, Chris Brogan, Mark Schaefer, and others. Airbnb offers a great range of accommodation options nearby your preferred social media conference. Book today! Hosted by the award-winning digital marketing agency Stone Temple, it will feature several of the greatest minds in digital mobile marketing who will discuss some of the most topical issues in the industry today. You’ll come away with actionable and tactical ideas to implement in your own company to help grow your brand and maintain a competitive edge in today’s rapidly evolving mobile digital marketing world. Speakers include Erin Everhart, Senior Manager, Media Strategy & Mobile at Home Depot, Melissa Walner Director, Global SEO at Hilton Worldwide, and of course our own Maximize Social Business alumni Mark Traphagen, who is currently Senior Director of Brand Evangelism at Stone Temple. This event is also unique in that it is purposely capped at 300 to energize sessions, maximize learning and power-up networking to make sure you win big. Haven spoken at last year’s event, and confirmed to be speaking at this year’s event, I can personally highly recommend this event for its extremely tactical and actionable advice. Guest speakers include Brian Halligan, CEO of Hubspot, Melanie Deziel, Director of Creative Strategy for Time, and Larry Kim, Founder of WordStream. Social Media Strategies Summit occur annually at several American locations and are great events for corporate social media marketing professionals. At this event, you will be able to fuel your social media strategy through compelling content, customer experience, brand storytelling, advocacy and technology. If you missed the February event in San Francisco, you won’t want to miss this April event in Chicago! Guest speakers for this event include Lauren Gerstner, Director, Global Social Media for HP, James Vetrano, Social Media Manager for Kraft/Heinz, and Christine Montgomery, Head of Online and Social Media for The World Bank. Social Media Week is a 3 day conference serves as a forum for ideas, trends, insights and inspiration for brands to leverage social media in the digital age. The event will feature a central stage for keynotes and panels, multiple rooms for workshops, masterclasses and presentations, and an area dedicated to co-working, networking and interactive installations. Can’t make this one? Good news: Social media week happens several times a year, all over the globe. When marketing and sales teams work together and align their objectives and strategies, organisations can seize new opportunities that make a real impact on the bottom line: Revenue! This is one of the best social media conferences in Australia that brings together social innovators, inspiring brands, and industry experts to show how social marketing and social selling can work in tandem to increase your brand reach and grow revenue for your business. Social Media Camp offers a broad spectrum of delegates from all over the world in a variety of industries – small business, large business, government, education, and non-profit. Not only are best practices covered, but the cultural impact of social media is explored. Social Media Camp is Canada’s largest social media conference. It is a great conference that covers all the key issues for getting the most out of social media marketing. 150+ growth marketers and execs from companies like IBM, Google, HubSpot, AMEX, Sprinkrl, Spotify, Grubhub, Vice Media, Wistia and ZocDoc have already registered for the conference.Don’t miss your opportunity to join them! You’ll learn battle-tested growth marketing strategies and tactics, straight from the thought leaders who pioneered them.So you can start hitting the growth numbers your company deserves. Register Today and save 30% with promo code SME. Social Media Today’s premier social media conference has returned to redefine what social media means for your business, your brand, your future. To get your messages across the digital and social universe and to test their effectiveness you must navigate the ins and outs of live streaming, SEO, storytelling, social selling, Snapchat, Instagram and so much more. At The Social Shake-Up on May in Atlanta, speakers from the Atlanta Hawks, Oracle, American Cancer Society, Arby’s and The Coca-Cola Company will show you and your team how to take your social media strategy to the next level. This three-day social media conference is designed for digital, social, marketing, PR and communications professionals looking for new innovative ways to keep integrating social media into their overall business strategy. With over 1,000 marketers expected to attend, EVENTtech specializes in using social media and technology to optimize live experiences. Expect to learn about the latest trends on connecting digital and live and how to optimize them through social media. An exclusive event for top level social media professionals to grow their peer network and stay abreast of the latest developments in digital media and technology. An industry network event for professionals in public relations, marketing, advertising, technology evangelists, digital, media buyers and other media industry professionals. The high light of the evening is a series of presentation by industry thought leaders giving insights into different technology and media channels. Organised by the Association of Independent Schools (AIS) will cover areas like developing savvy marketing and communication campaigns, receive clarity on managing risk and legal obligations. Video in social media has become so important that for the first time we are adding an exclusively video marketing conference to this list. WistiaFest is the annual user conference for the video platform leader Wistia and celebration of all things about video marketing. This is the event where video marketers share the challenges they encounter and sharing of ideas on how to overcome such challenges. Meet a broad range of people who are passionate about video marketing and business. Rub elbows with the video experts across multiple fields. Speakers have yet to be announced, but we expect they will include a good group of video marketing industry experts. The move towards digital everything has meant rapid change for businesses. The Corporate Social Media Summit offers a unique opportunity for brands to learn how to embed social and digital technology across their businesses. As an attendee, you will have the opportunity for one-on-one interactions with customers and potential customers. There will also be learning opportunities with innovative speakers, and interactive panels. And the CSM Awards Show evening will recognize leaders in the industry—or maybe you’ll receive recognition yourself! Join an exhilarating mix of content creators, social media stars, entrepreneurs, top brands, activists and fans at #BlogHer! You’ll experience inspiring keynotes, sessions where you’ll learn the latest techniques, and find opportunities to network with YOUR community. Want to learn the latest in social media marketing and customer service? Discover the latest on Facebook, Instagram, Twitter and more at Social Media Day San Diego. This is a huge social media event with an opportunity to learn and network as industry thought leaders share their insights. Join ThinkContent London as they gather the brightest in the Content Marketing industry and regain focus on what matters most – delivering performance while still creating inspiring content that audiences want and need. Let’s ask ourselves, how can we unite the power of brand, performance marketing, and exceptional storytelling to achieve the greatest business success possible. It’s no secret that the rise of social media is revolutionising the ways and channels through which businesses market their offerings. In particular, the influence that popular social media accounts with large audiences have on consumers’ awareness and perceptions of brands, products and services cannot be ignored. On the contrary, it should be a crucial marketing consideration for any company, from small family-owned businesses to large corporations. So what is the best way to leverage such an influence? MUSE have invited one of Australia’s most prolific entrepreneurs in the tech startup and media industry, Taryn Williams, to hold a workshop dedicated to revealing the secrets of a successful collaboration with powerful influencers. Leveraging her vast professional experience in the field, Taryn will deliver a one-hour session aiming to inform and educate through case studies, and engage the audience with a Q&A and workshop. The International Social Marketing Conference (ISMC) objective is to unite all Australian social marketers to share latest tools, best social media marketing practices. Attendees will learn new social media marketing insights from top industry experts and will have fantastic opportunities for networking and exploring latest and emerging social media marketing technologies. From its inception, the conference has focused on the best practices for studying the impact and implications of social media on society. Organised by the Social Media Lab at Ted Rogers School of Management at Ryerson University, the conference provides participants with opportunities to exchange ideas, present original research, learn about recent and ongoing studies, and network with peers.The conference’s intensive three-day program will feature full papers, work-in-progress papers, panels, and posters. The wide-ranging topics in social media showcase research from scholars working in many fields including Communication, Computer Science, Education, Journalism, Information Science, Management, Political Science, Sociology. With more than 150 sessions offered by some of the industries leading marketers, this conference is oriented towards helping brands shape their entire content marketing strategy. Topics covered include strategy, integration, measurement, and the integration of social media. Content Marketing World continues to be the largest content marketing event on the planet. It’s the one event where you can learn and network with the best and the brightest in the content marketing industry. You will leave with all the materials you need to take a content marketing strategy back to your team – and – to implement a content marketing plan that will grow your business and inspire your audience. Day one will be a host of leading industry experts from Facebook, Instagram, VICE Media, The Urban List, Junkee Media, Hubspot, MTV & Hello Social bringing you the most up to date research, insights, case studies and take away strategies on how to effectively engage millennial consumers. Topics Covered include: How to develop effective engagement strategies, Changing media consumption habits, The latest thinking on Social Media, Mobile purchasing trends, Getting to grips with social influencers, The latest technologies & usage, Insights into all areas of youth lifestyle & culture, Understanding the mindset of Millennials, Workplace motivations & the start up generation, Using video as a tool to engage and the rise of native advertising. 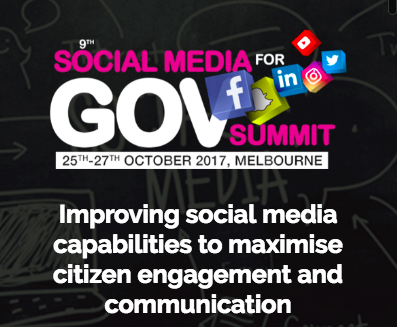 This summit will specifically focus on how to improve video content performance on social media platforms, capabilities required to prepare and manage social media crisis situations, advertising strategies to better engage target audiences and how to better benchmark, analyse and evaluate social media impact. While we often get caught up in the now of social marketing, it’s critical to also consider the future, and where you should be paying attention to in the months to come. And while virtual reality, augmented reality, hyper local social platforms are some of the answers most would revert to when thinking about the future of social, what’s equally important is how we’ll get there, and what, practically, the evolution to these next stages of social communication will mean for you and your organisation. This two day agenda has been curated to ensure delegates leave feeling inspired to innovate and review their current social strategy. With social opportunity rising, knowing where to place your focus next is paramount to staying relevant and engaging. Delegates will be taken on a journey through current pioneering social success and the future landscape currently shaping the next 12 months of social innovation. How advertising and content formats will change as consumers retreat to private communities and personalized arenas. How data will be regulated in this new world and where individuals will regain control of their privacy with new technologies. Where brands can use technology like bots and AI to serve the needs of individuals, without losing the powerful connection of 1-1 conversations. How the traditional tactics that we’ve used to build social brands in the past will shift to meet the demands of digitally-native consumers and the expectations of personalisation. The only constant in social media is change—are you ready for the future? Ignite your social media strategy with the latest tools and tactics at the Social Shake-Up Boot Camp at San Diego. This one-day intensive event will feature top B2B, B2C and nonprofit brands like Taco Bell, IBM, GoDaddy, American Heart Association, LinkedIn and more who will present a master class in topics ranging from Facebook and artificial intelligence to SEO and Snapchat. This year’s SocialFresh Conference is packed with the most up-to-date and actionable training for the modern social and digital marketer. You will keep track of the latest social media trends–and where the industry is headed. The Social Fresh attendee is a professional digital marketer, executive, or business owner. If you’re working to grow your audience, find new customers, or increase revenue, Social Fresh is for you. Training is accessible for B2B and B2C. The most popular attendee industry groups include higher education, hospitality, retail, non-profits, finance, healthcare, retail, agencies, and government. The ICSMT: International Conference on Social Media and Technology aims to bring together leading academic scientists, researchers and research scholars to exchange and share their experiences and research results about all aspects of Social Media and Technology. It also provides the premier interdisciplinary forum for researchers, practitioners and educators to present and discuss the most recent innovations, trends, and concerns, practical challenges encountered and the solutions adopted in the field of Social Media and Technology. At the San Francisco edition of the Social Media Strategies Summit, experts on social media will be sharing their tips on how to leverage trends and opportunities in social media to become a better marketer. SMSS offers resources for social media marketers of all skill levels.This is a comprehensive 3-day social media marketing summit that addresses the toughest challenges marketers are facing in social media marketing, customer service, employee engagement, measuring ROI, and more. This educational experience moves far beyond the basics of social media; you’ll leave with a fresh perspective on the digital marketing landscape, and key strategic insights on how social fits in with corporate objectives. You’ll learn from a mix of experienced in-house practitioners and award-winning agencies to get a 360° view on what it takes to execute a successful, revenue-driving social media strategy. Guest speakers at this event will include Michael Smith, Director of Digital Strategy for Gatorade, Alisa Ben, Vice President, Insights for Universal Music, and Yvette Irvin, Director, Global Digital & Social Innovation for Banana Republic. With eight out of 10 Australians on social media, there is now an increased focus for businesses to become more digitally accessible and transparent to their customers and communities. In order to engage citizens and inform the public, marketers are now focused on driving consumer engagement and effectively informing decision making. Akolade’s Social Media WA Summit provides leading case studies exploring strategic planning for driven social media excellence, measuring ROI on social media activity and a look into the next wave of social media platforms. This social media summit brings together key social media experts to deliver case studies, insights and strategies to build audience trust and enhance consumer engagement.